Our nation’s space program is currently undergoing a major transformation, from a time in which the federal government did almost everything, to one in which private industry is playing an increasingly important role. How did we get to this point, and what are some of the reasons behind the changes that are occurring? What can we expect in the years ahead? This presentation will describe some of the exciting activities now taking place in the commercial space transportation arena, from flyback boosters and reusable launch vehicles, to preparations for suborbital space tourism and the proliferation of spaceports. 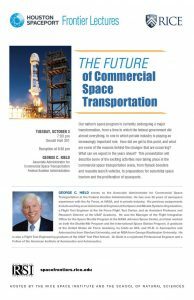 GEORGE C. NIELD serves as the Associate Administrator for Commercial Space Transportation at the Federal Aviation Administration. He has over 30 years of aerospace experience with the Air Force, at NASA, and in private industry. His previous assignments include working as an Astronautical Engineer at the Space and Missile Systems Organization, a Flight Test Engineer at the Air Force Flight Test Center, and an Assistant Professor and Research Director at the USAF Academy. He was the Manager of the Flight Integration Office for the Space Shuttle Program at the NASA Johnson Space Center, and later worked on both the Shuttle/Mir Program and the International Space Station Program. A graduate of the United States Air Force Academy, he holds an M.S. and Ph.D. in Aeronautics and Astronautics from Stanford University, and an MBA from George Washington University. He is also a Flight Test Engineering graduate of the USAF Test Pilot School. Dr. Nield is a registered Professional Engineer and a Fellow of the American Institute of Aeronautics and Astronautics.